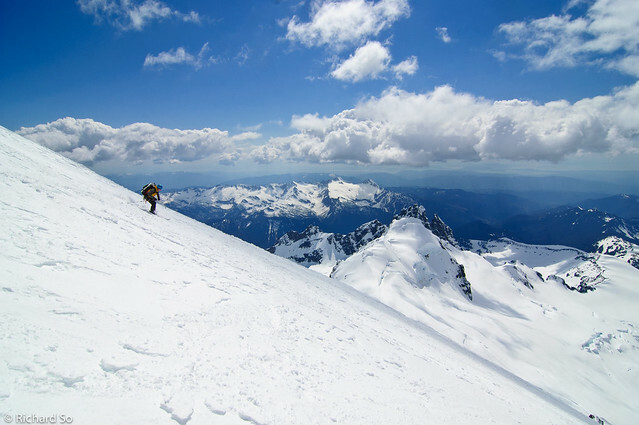 After two weekends of climbing, I was craving snow, blue skies, sunshine and mountain views. Greg picked up me up shortly after 5am and we headed eastward across the border towards Mount Baker. We were a little behind schedule, as Greg had to wait five minutes before McDonald's switched over to their breakfast menu. I'm not sure why he didn't just pick me up first and then to McDonald's so we could both order some morning grease. Mount Baker contrasts against the flat valley fields and it was hard for us to avoid staring at our possible ski line in the early morning light. Ski conditions were fast getting up to the Black Buttes via the Grouse Creek route. 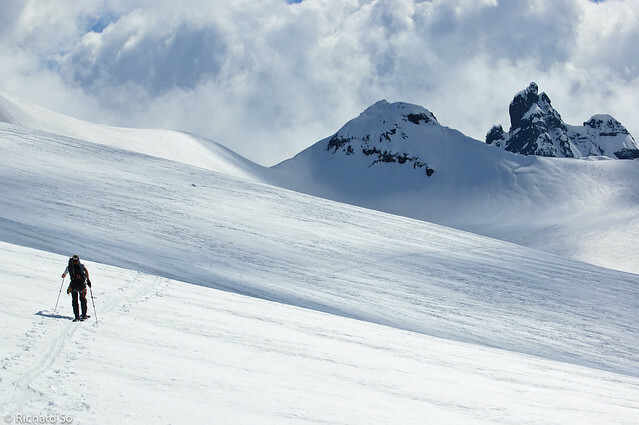 From the outhouse, there was enough snow to skin directly to the open avalanche slopes. 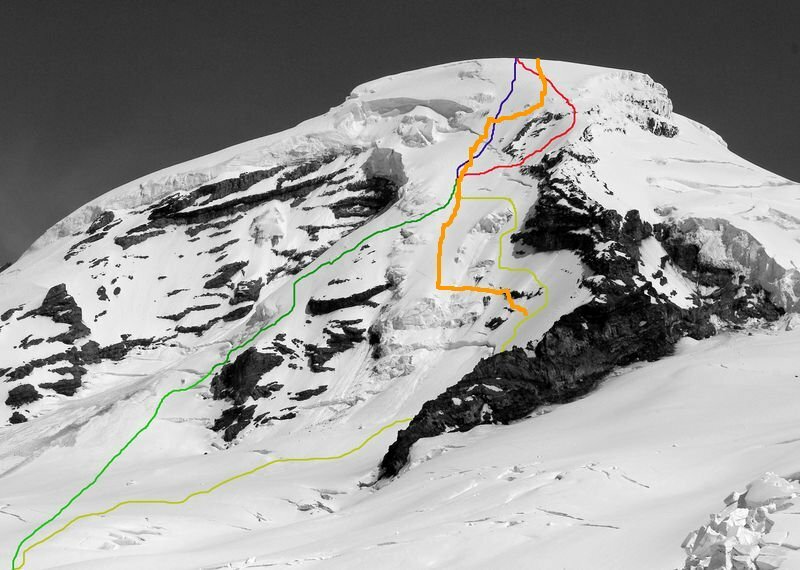 The route up the Coleman Glacier was in excellent conditions with only a few open crevasses on the ski route, ski crampons were useful until 8000ft, when the snow transitioned from a solid crust to soft early-spring conditions. 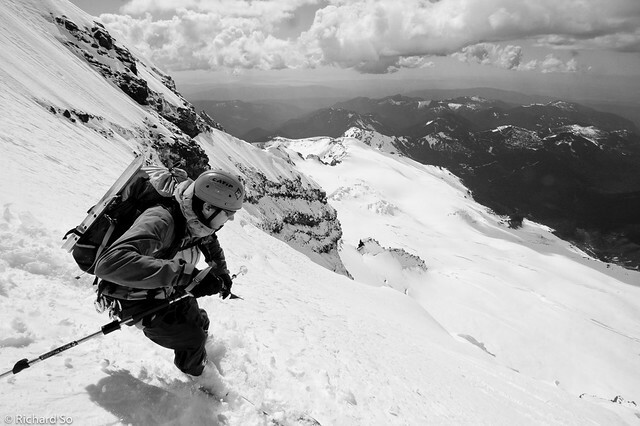 From the col, it was a mix of bootpacking and steep ski switchbacks. I was starting to feel the effects of a lack of sleep from the previous night and a busy work week. A quick nap on the summit was in order, as the weather conditions on the summit were excellent with warm temperatures and light winds. Everybody was hanging out up there, brewing up tea, eating lunch, doing yoga and enjoying the views of the North Cascades and the San Juan islands. Has anybody held a yoga class up here yet? After a short nap, it was time to look for the entrance. 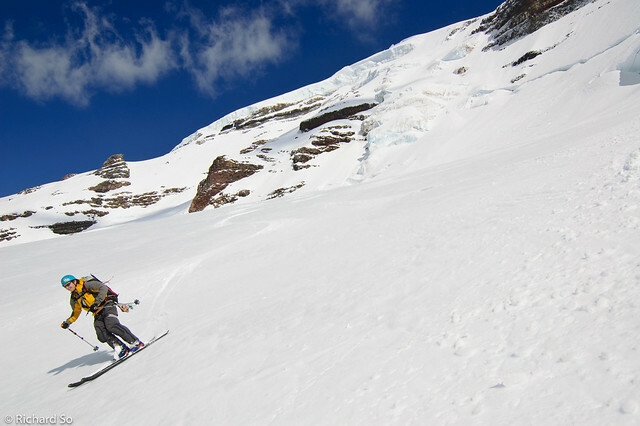 The snow conditions at the top of the face were actually corn and chalky powder instead of ice as I had envisioned. 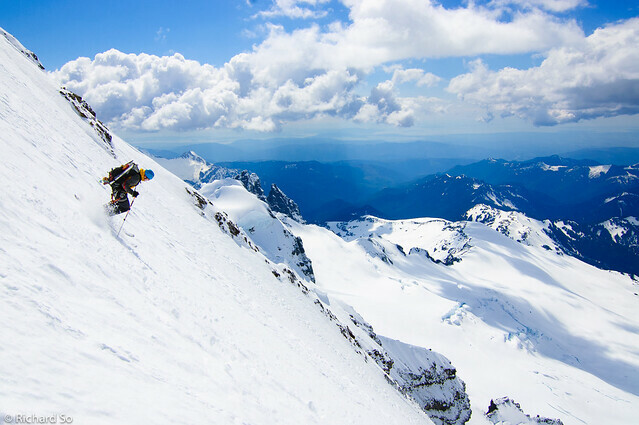 Slowly, turn by turn, we committed ourselves onto the Coleman Headwall. I made one turn, and then another. My skis were holding a good edge on the soft layer of corn snow. The slope ahead of me slowly rolled off and I could only see a few turns ahead. I looked back up at Greg, who was also looking uncomfortable with the terrain, but assured me that we were in the right spot. It was a blind rollover ahead of us, with nothing below, therefore we must be in the right spot. Reassuring isn't it? I made a few more turns to the left and noticed rockier terrain and more sastrugi formations. This can't be right, I thought. 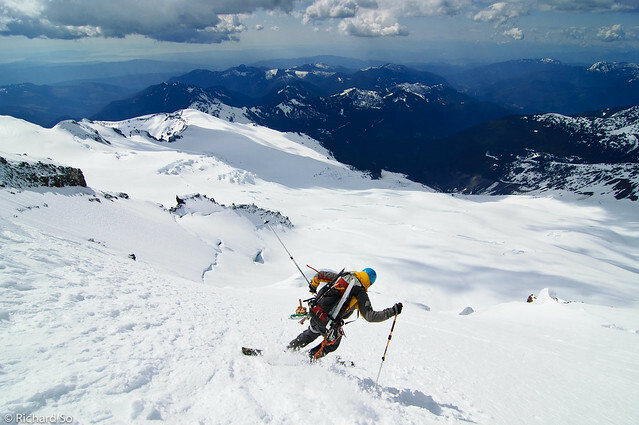 I started to think back of the mental image that I took of the descent while skinning up the standard route and quickly realized we were too far to the west, heading towards a dead-end descent of the Roman Nose. 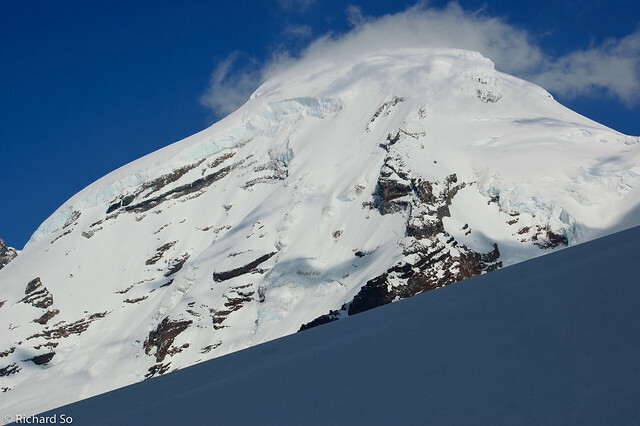 Realizing our mistake, I made an exposed traverse rightward on firm snow to reach the main open face. 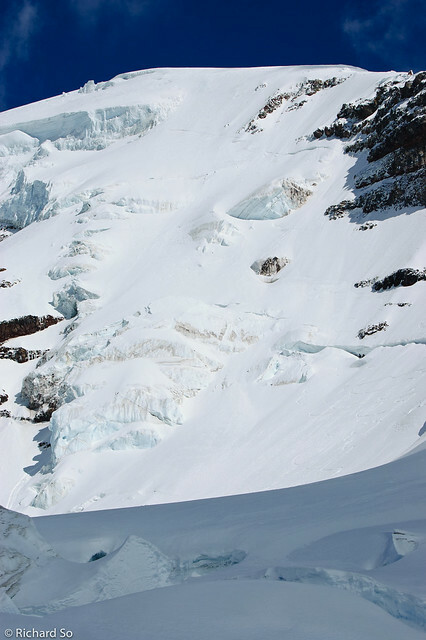 I looked up and down, confirming our location on this massive hanging wall of snow and ice. 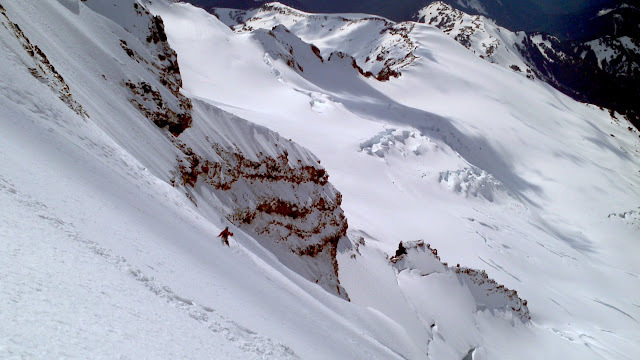 We made slow turns down the face, making careful turns on this wildly exposed slope. The angle was only in the upper forties, but this wasn't the type of terrain to make a mistake in. I'm not that comfortable with my bindings yet, this was my second day with Dynafits and I'm glad they worked as advertised. 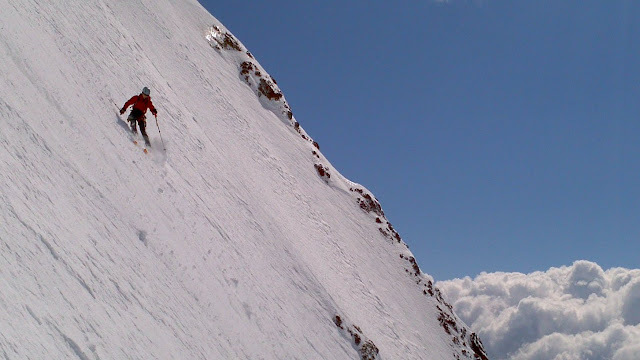 Steep turns on the Coleman Headwall. I'm glad Greg was able to pull out his camera as he waited for me to reach his solitary position on the slope. Photo by Greg W.
With one hand firmly grasping his picket, Greg worked his way down the soft snow. Sluff managment became an issue in the lower half of the slope and we paused between every few turns to let the snow tumble over cliffs below. 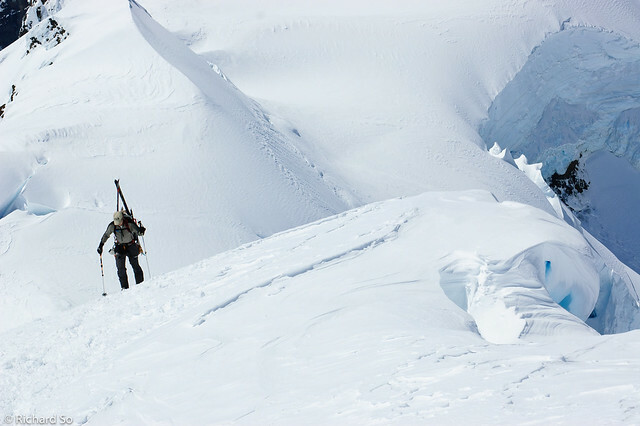 Me leading the way down towards set of bergshrund at the bottom of the face. 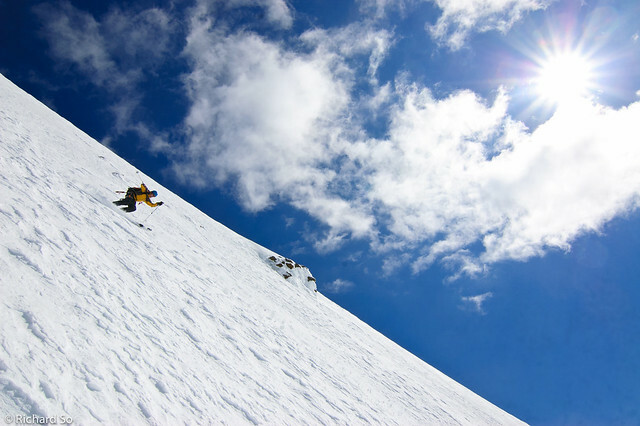 Photo by Greg W.
The skiing was certainly a level above any of the skiing I've done to date. 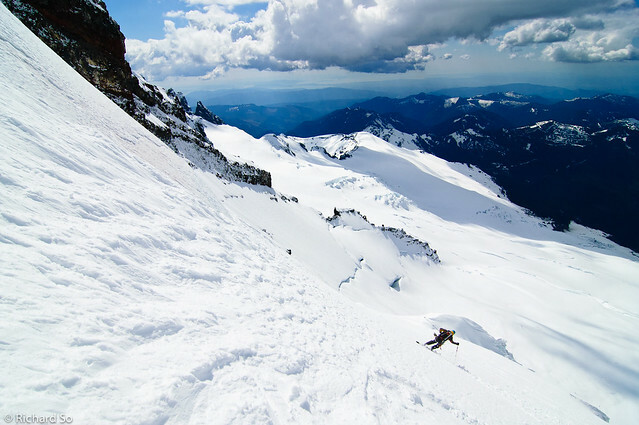 The bulk of the skiing isn't that steep, the upper pitch is around fifty degrees, with the bulk of slope averaging forty five degrees, for basically 2000ft. The icefall at the bottom, the multiple bergshrunds and the very scary possibility of rockfall or icefall makes this moderate slope much more challenging. Greg and I both thought that even if the conditions were perfect and everything seemed in our favour, we weren't sure we would/could ski it ourselves. It's quite easy to look at ski websites these days and read various casual trip reports of steep skiing, but ultimately for me, getting motivated to go out and make steep turns still takes a lot of effort from me. It's much more comfortable reading about difficult skiing from the comforts of my desk chair. 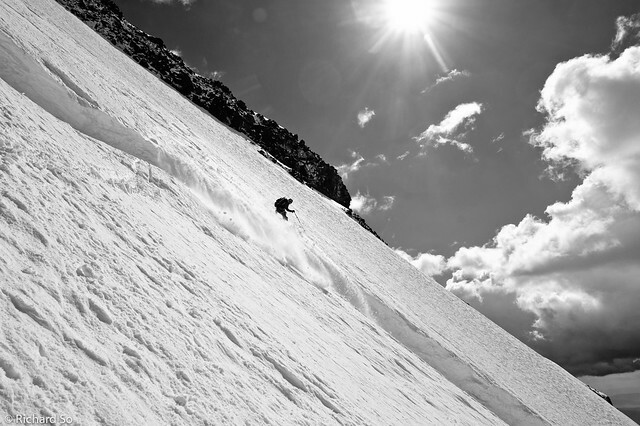 Greg skiing away down the Coleman Headwall. The final crux of the descent, involving a three foot drop over a bergshrund guarding the exit. 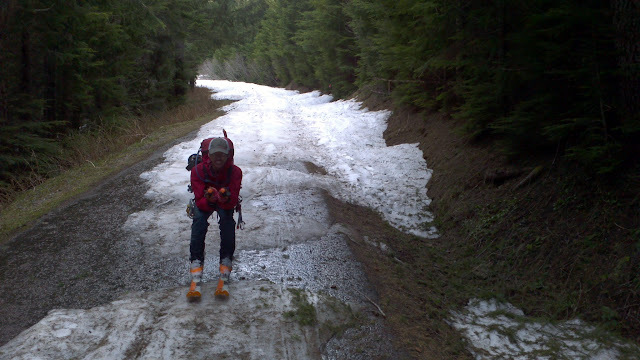 From here, it was a lazy ski out on firm to slushy isothermal snow on the Coleman Glacier and Grouse Creek. It was a relief to be back in familiar terrain. 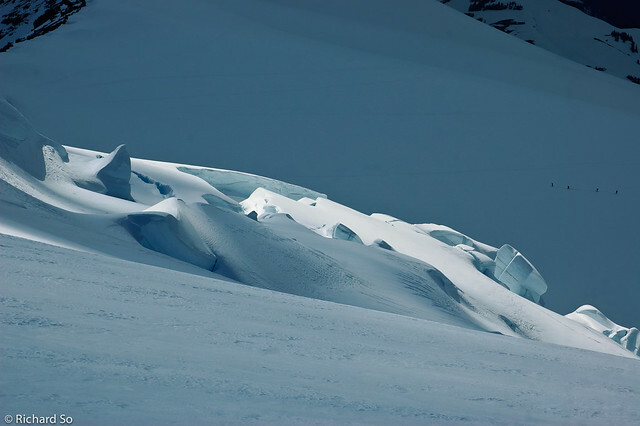 Skier in the shadows on the Coleman Glacier. Parting shot of Mount Baker. 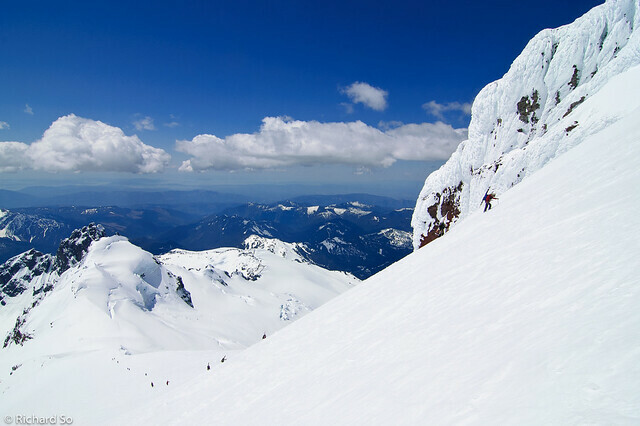 I love being up here in May, with just the perfect combination of sunshine, easy access, snowy glaciers and plenty of elevation gain. If you ski fast over asphalt, there's less wear and tear on your ski bases right? We descended the orange line. Photo from WikidSteeps.com. Round trip was probably a hair over 8000ft. Needless to say, the beers and pizza that evening were delicious. Found your blog randomly! You go on so many amazing adventures. I am inspired! Keep it up. Looking forward to hearing about your adventures this summer! Thanks a lot! I'm glad you're enjoying it.